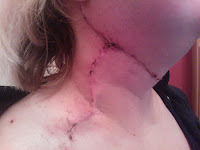 Here's today's scar picture. I think some of it is fading a bit - what do you reckon? The only thing is, over the last couple of days it has started to pull in a very painful way. People had said that it might itch so much that it would drive me crazy but this isn't like that. Me and Roy Walker from way back! ﻿Meanwhile here's something to make you laugh. 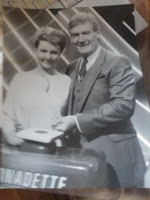 this is the photo that I dug out for The Sentinel the other day, It is the publicity photo from when I did Catchphrase. It was my first ever TV quiz show and I was taken down to Maidstone in Kent an put up in a 5* hotel for several days. All meals were provided and we were chauffeured everywhere. No wonder I got a taste for it! Roy Walker was lovely - although almost as nervous as we were. The thing I most remember is him wandering round the set in his tweedy dressing gown.